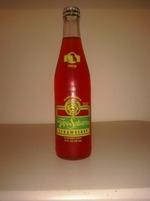 This is the second Topo Sabores beverage we've tasted and we'll be doing another one coming up soon. This one was donated by a Soda Jerks reader and I've seen it available at HEB. Now although this is a bottled beverage, this is by no means attempting to be or is a premium soda. They are sold fairly cheap, less than a dollar usually, so the fact that this is chock full of chemicals is to be expected. It is a really decent strawberry soda. I haven't had a strawberry in quite a while but I can guarantee that this is the sweetest strawberry I have ever had. It almost has a Jolly Rancher flavor to it, but without the bite or sting that the candy does. I can recommend this. Seems most appropriate for outdoor consumption during mild summer activities. Again the only negative is this is all chemicals. What's the best part about it you ask? The inside of the cap says "Thank You For Participating." Awesome.